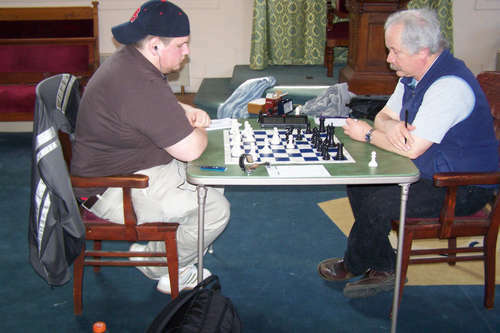 04.06.10 Bangor area's highest-rated player, Steve Abrahams, made the trip to Aroostook County to take first place at the Aroostook Open Championship played on April 3, 2010 at the Masonic Lodge in Houlton. 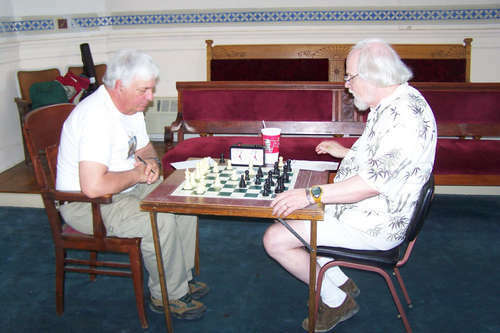 Tournament winner, Steve Abrahams (left), plays Ray Haines in round three of the Aroostook Championship tournament. Steve Abrahams went 4-0 to take first at the Aroostook Championship. On his way to this perfect score Abrahams defeated four very capable players: Lance Beloungie (1660), Roger Peterson (1742), Ray Haines (1799) and Roger Morin (1991). Trailing Abrahams and tieing for second place with 2.5 points were Ed Nevells and Roger Peterson. Roger Morin, Ray Haines and Roger Hardison scored 2.0 points to tie for fourth place. John Ellison scored 1.0 point and Lance Beloungie, who went scoreless, rounded out the crosstable. 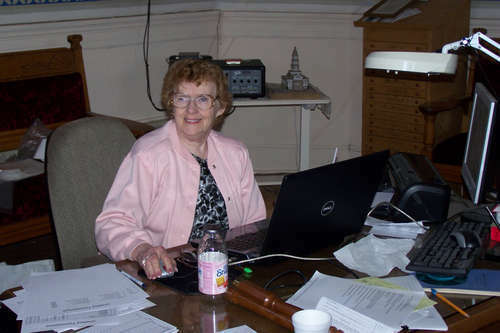 This event was directed by Lois Morin. Thanks to all who participated and to the Houlton Masonic Lodge for hosting. 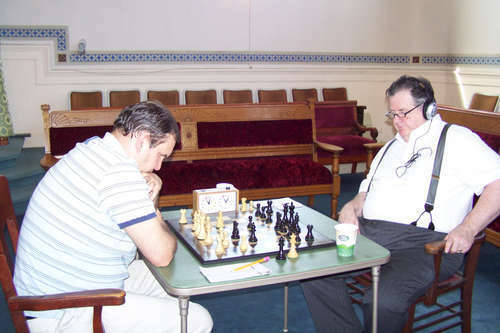 Second place finishers in the tournament Roger Peterson (left) and Ed Nevells play to a draw in round three. 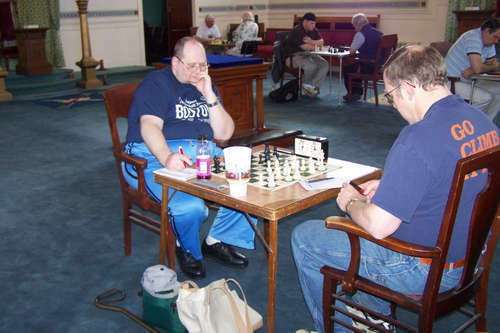 Roger Hardison (left), here playing Lance Beloungie, scored 2.0 points. Roger and Lois, Thanks for the enjoyable event. You were great hosts with a good playing site and great prize fund. Thanks for your support of chess in Maine. My Wife and I made the 2 hour trip North on I95, on a beautiful spring day in April. The view of Mt Katahdin from mile markers 246 to 264 is breathtakingly majestic. I would like to thank the Morins for being Great Hosts and for the Masons for letting us use the Masonic Hall. Also for their donation to the prize fund. I didn't do as well as I did in the East Millonocket open but had fun for sure. I wish that more players would make the trip next year, I have it marked on my things to do already for next year. Please try and make it.